Picture this. You are standing in an aisle at your local Arizona grocery or convenience store. You have shelf after shelf of varying sunscreens to look at. Different brands, different bottle sizes, different application treatments, different SPF numbers. The list goes on and on, yet, how do you know what you should be looking for in a sunscreen? What should be your deciding factor? For many, choosing the cheapest sunscreen with the highest SPF is a common go-to “solution.” However, there are many other factors to consider. Factors that may have a bigger impact on your skin and on your health than simply grabbing the highest SPF number you can find. Choosing the right sunscreen can mean the difference between receiving a dangerously painful sunburn, and not receiving one at all! By understanding what all of the differentiating factors regarding sunscreens mean and how those can affect you, you’ll be better able to choose the best sunscreen available for your skin. 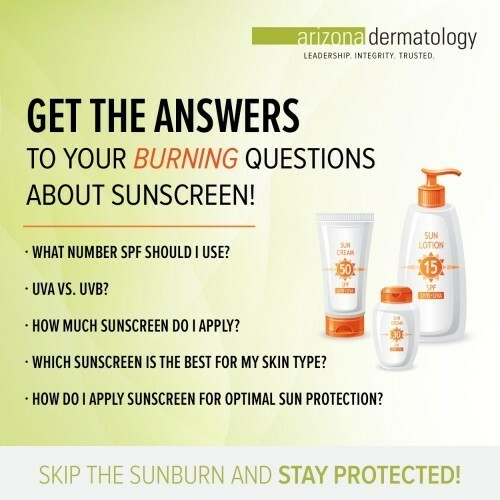 At Arizona Dermatology, we understand the importance of finding the perfect sunscreen to keep your skin safe and protected from Arizona’s harmful ultraviolent (UV) rays that cause dangerous sun burns and damage, both of which can lead to skin cancer, wrinkles, age spots and more. Because of this, we are going to explain what you should look for when choosing a sunscreen, what all of those things actually mean, and list out some of our best sunscreen recommendations! Before jumping straight into our top sunscreen picks, there are a few things you need to be educated on. When looking for a sunscreen, you’ll want to pay attention to the SPF number, ingredients found in the sunscreen, and whether that sunscreen is broad spectrum or not. These three differentiating factors are important to understand and look for when you choosing your sunscreen, especially if skin protection is as important to you as it is to us! SPF, also known as Sun Protecting Factor, is the form of measurement sunscreens use to determine the ratio of UV rays that will be blocked. SPF is a common acronym that most people look to when choosing their sunscreen. Sunscreens range in SPF from a SPF 5, all the way up to SPF 100+. The higher SPF sunscreens only came out in recent years as the big sunscreen companies continuously tried to one-up one another in order to reign supreme with the “strongest” sunscreen on the market. An SPF 50 will block 50% of harmful UV rays and because (as the bottle states) you should reapply at least every hour and a half, you will be well protected from the harmful rays. What Number SPF Should I Use? Now, there is much debate over whether these higher numbers are better sun protectors or not. While the numbers can make a difference, because sunscreen needs to be reapplied on a regular basis, we recommend choosing a sunscreen that is SPF 30+ and following the directions on the bottle very closely when it comes to how often you should reapply. Now, if you find yourself sweating because of the heat, or jumping in and out of water, it is important to reapply more often than every hour and a half hours as the water and sweat can affect how long the sunscreen works. When choosing a sunscreen, we highly recommend choosing something that is Zinc and Titanium based. These ingredients are all natural and much better at protecting your skin from the harmful UV rays than sunscreens based with other less effective ingredients. Zinc and Titanium are commonly found in broad-spectrum (full-spectrum) sunscreens, which leads us into our next section of things to look for in sunscreen. While this is a rather newer term for the typical sunscreen buyer, it is important to understand what broad spectrum is, and why a broad spectrum sunscreen is critical for your skin. The sun emits two types of UV lights: UVA and UVB lights. UVA—UVA rays age your skin and cause long-term damage such as wrinkles and age spots. UVB—UVB rays are what cause your skin to burn. Broad spectrum sunscreen protects against both UVA and UVB rays, giving you a more well-rounded protection. Sunscreens typically come in two main forms. Both are great options and come with their own lists of pros and cons. For instance, lotion can be applied far in advance and soaks into your skin evenly and smoothly. Spray on the other hand, can be quickly and easily applied, even to those hard to reach areas! But when it comes to understanding how to properly apply your sunscreen to ensure optimal sun protection for your skin, there are a few things to keep in mind! Applying your sunscreen, whether a lotion or a spray, at least 30 minutes prior to going outside in the sun is key. By giving yourself this time, you are allowing the sunscreen to soak into your skin, ensuring it doesn’t simply wipe off when you start moving around. This is especially important if you plan on going in the water, or foresee yourself sweating at all in the heat. Rubbing your sunscreen into your skin goes hand-in-hand with applying it 30 minutes before going outside. For total body coverage, apply a full ounce (the size of a golf ball) of sunscreen. Both allow the proper amount of sunscreen to soak into your skin, giving you optimal sun protection! Now that you know what to look for when searching for the best sunscreen, you can enjoy the outdoors that much more knowing your skin will be well protected from the strong Arizona sun! If you are unsure if the sunscreen you use is doing its job, check in with our list of items to look for in sunscreens. 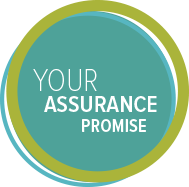 If you are still unsure after going through our list, it is best to ask your dermatologist!